Colour Kodachrome 35mm slide depicts a golf course with two unknown people in the distance walking on the green with two structures on either side of the green and a post with a bucket on the green. There are large houses and trees in the background. 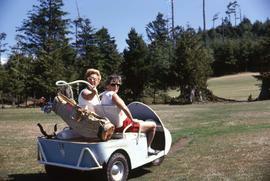 Colour Kodachrome 35mm slide depicts Phyliss Snider and an unknown woman sitting in a golf cart looking back at the camera with a golf bag on the back of the cart. 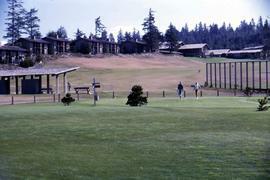 Colour Kodachrome 35mm slide depicts three unknown men on a golf course with the man in the centre preparing for a shot. There is a house in the background. Colour Kodachrome 35mm slide depicts two unknown men holding golf clubs. When of the men has his hand on his hat and he is smiling at the camera.